During summer, I’m really not into making complicated cakes that take a long time to prepare and bake. 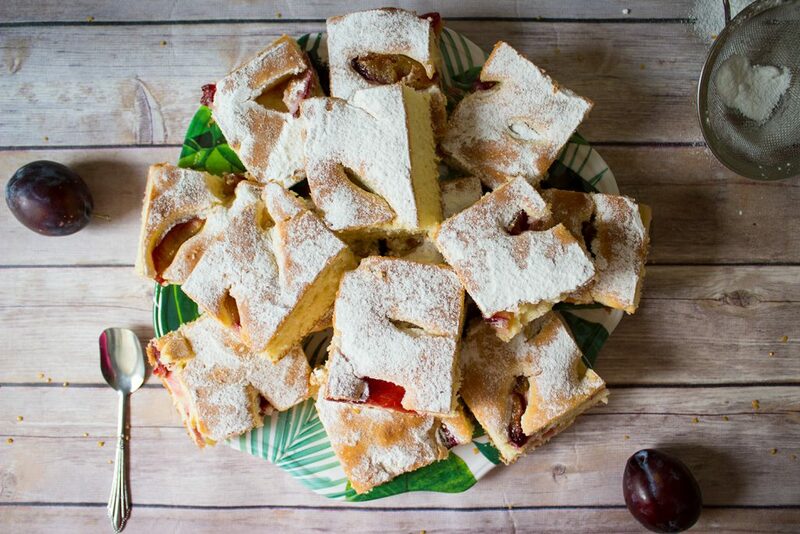 One of my go-to dessert recipes for summer is this simple cake filled with fruits – this time, I decided to use plums. 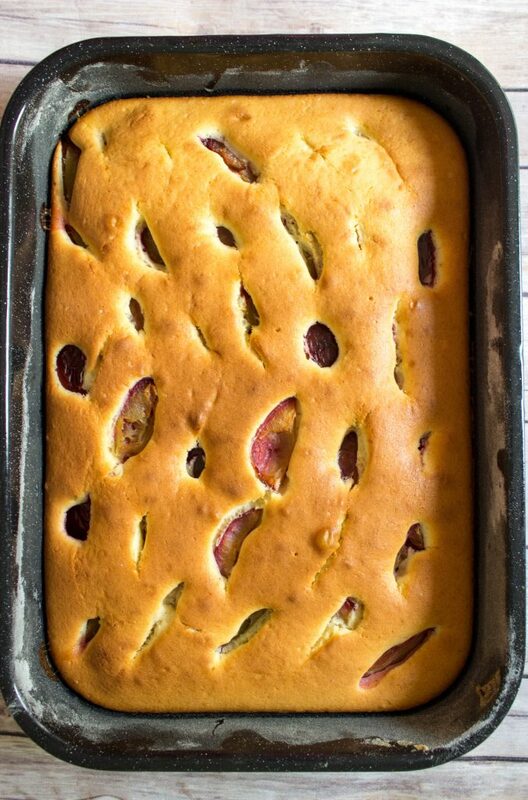 I would usually make this cake with apricots during summertime, but I received some really good-looking plums from my dad, and since I don’t really like eating them raw, I decided to use them for this fluffy, moist, easy-to-make plum cake. I’ve already used the recipe for the cake batter when I posted the rhubarb, strawberry and meringue cake, and since it’s my favorite batter for this type of dessert, I preferred using it this time as well. 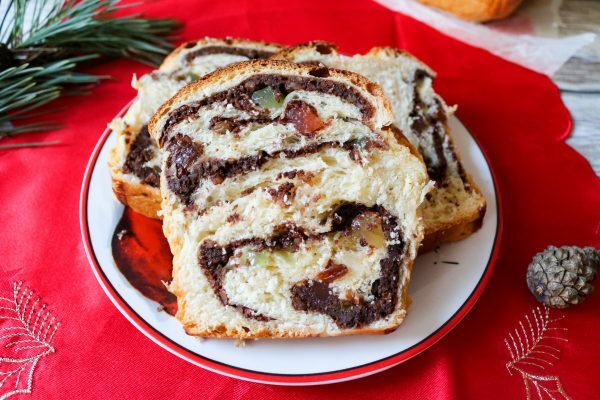 I’ve seen that many bloggers, and Romanians in general, prefer to make these simple fruit cakes with a cake batter which only contains eggs, sugar and flour. If you use this version, you have to beat the egg whites really well and then slowly incorporate the rest of the ingredients to make sure that the air remains in the batter. With my version of the simple plum cake, you’ll see that you can use only one bowl, and all you have to do is mix the ingredients, step by step, then add the fruits over the cake batter, and that’s it. Perfect for summer, right? Adding the seeds of a vanilla bean will definitely enhance the cake’s flavor, so make sure you use this ingredient. 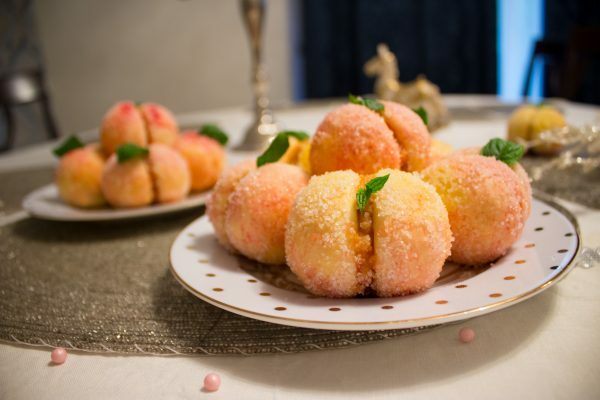 Remember that you can use almost any juicy fruit with this cake batter – I would use apricots, peaches, nectarines, strawberries, or sour cherries. Since all these fruits are a bit sour, it’s nice to dust the cake with some powdered sugar after you take it out the oven and it’s already cooled down a bit. The cake will keep well for up to 3 days, covered and refrigerated. In a large bowl, mix the sugar with the soft butter until combined. Incorporate one egg at a time, mixing well after adding each egg. Scrape the vanilla bean and add the seeds to the mixture. Add the salt as well. Mix the flour with the baking powder, and incorporate 1/2 of the flour in the mixture. Add 1/2 of the milk and mix well, then add the remaining flour, mix again, add the remaining milk, and mix until well-combined. Pour the mixture in a buttered, rectangular, large cake tin. 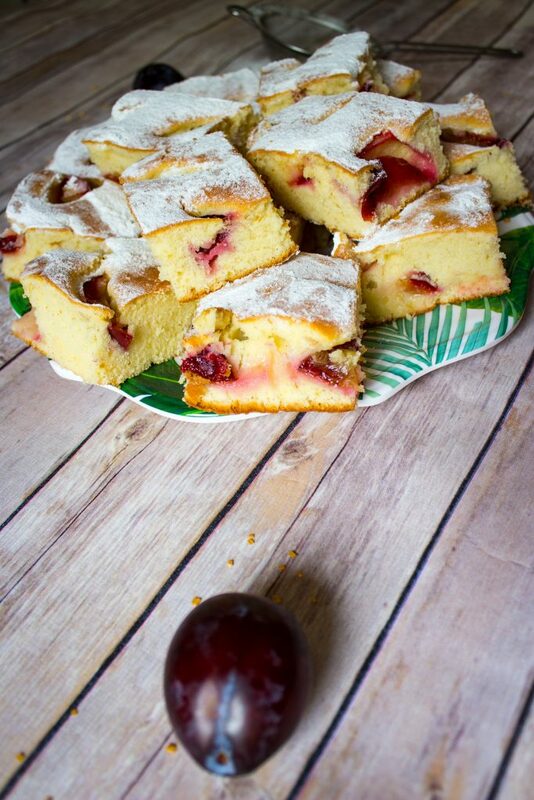 Cut the plums into quarters, then distribute them over the cake batter. Bake the cake at 180°C (360°F) for 30-40 minutes. After 30 minutes, insert a toothpick in the cake – if it comes out clean, it’s done. 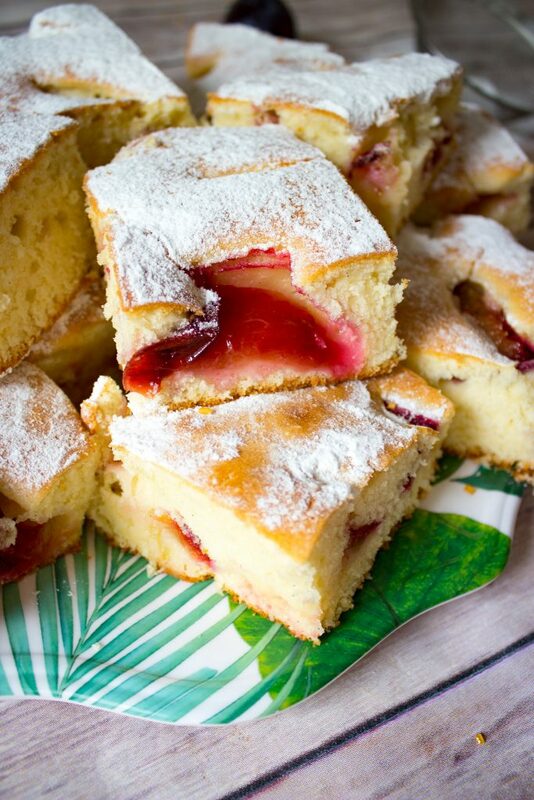 Let the plum cake cool a bit, then dust with lots of powdered sugar. Let it cool completely before portioning it. 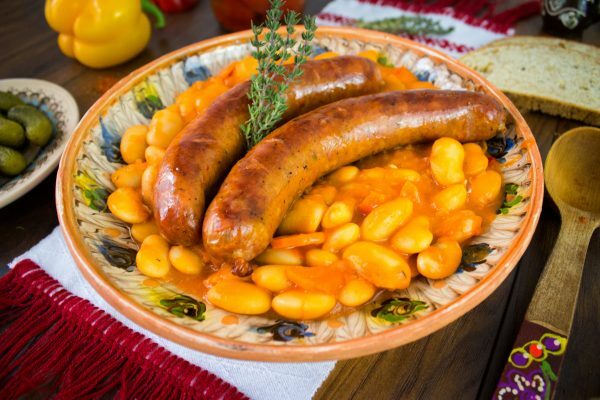 Într-un castron mare mixați bine zahărul cu untul moale până când obțineți o cremă. Încorporați câte un ou, amestecând bine după adăugarea fiecăruia. Răzuiți semințele păstăii de vanilie și adăugați-le în amestec. Adăugați și sarea. Amestecați făina cu praful de copt și încorporați jumătate din cantitatea de făină în amestec. Adăugați jumătatate din cantitatea de lapte și amestecați bine, apoi adăugați restul făinii, amestecați din nou, completați cu laptele rămas și amestecați până se combină bine toate ingredientele. Turnați amestecul într-o tavă medie, tapetată cu hârtie de copt. Tăiați prunele în sferturi, apoi distrubuiți-le peste aluatul din tavă. Coaceți prăjitura la 180 ° C timp de 30-40 de minute. După 30 de minute, introduceți o scobitoare în prăjitură – dacă iese curată, blatul este gata. Lăsați prăjitura cu prune să se răcorească puțin, apoi o puteți orna cu zahăr pudră. Lăsați-o să se răcească înainte de a o porționa.